One of the first NPCs you encounter in Knights of the Old Republic 2 refers to the Jedi/Sith conflict from the first game as “the Jedi Civil War”. It’s a beautiful phrase that forces you to imagine events from another perspective. The average cantina patron has no idea what a Sith is or how the dark side works. All they see is a bunch of terrifying space wizards thumping one another with laser swords over a religious schism. That’s what I love about KOTOR 2: it takes a universe of light and dark, and paints it in shades of grey. Don’t get me wrong, I enjoyed BioWare’s original KOTOR, but it’s the peak of the patented BioWare Binary Moral Choice. The black-and-white nature of the Star Wars universe leads to ridiculous situations, like the choice between turning off a piece of mining machinery or contaminating an ocean, for literally no gain. Your choices are all good or pantomime evil, which, while fun, doesn’t make for deep narratives. KOTOR 2 lives in the uncomfortable middle ground. One major character, Kreia, is a neutral Jedi, neither dark side nor light, who will criticise you for kindness or cruelty alike. In a way, her middle-ground reasoning is as contrived as the old binary, but the subtle writing presents it as her personal philosophy rather than a law of the universe. The NPCs of KOTOR 2 are full of contradictions, even the hunky Han Solo stand-in the Sith use as a Jedi-killer. 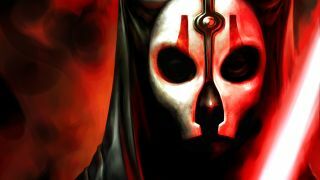 The player character is similarly between two worlds, a Jedi who followed the first KOTOR’s Darth Revan to war, but didn’t fall to the dark side with him. You are constantly asked why you did it. You can tell them you should never have gone to war, that you should’ve stuck with Revan and gone dark or, more interestingly, that you’re still in the middle. The characters of KOTOR 2 know more than you do, you see, and they’re not sharing. Instead, conversations happen naturally, dropping little hints of a greater truth. When you meet Boa-Dur, he calls you General, but doesn’t explain why. He also alludes to something that happened during the war, back on Malachor V. That’s where it all starts to fall apart. Let’s be blunt. KOTOR 2 is an unfinished game. By the time you reach Malachor V, everything is petering out. The signs were there from the start: cut content, loot randomly generated rather than placed by hand and oh-so-many bugs. The ending violates the “show, don’t tell” rule so hard you can almost hear the money running out. The popular belief is that Obsidian were pressured to put the game out in time for Christmas, but we’re talking about a game with two gender-exclusive companions, a fully implemented crafting system and a card-playing mini-game. If they’d had an extension, would they have finished what they started, or added a fully featured NPC shaving simulator? In many ways, KOTOR 2 feels like the end of an old era of RPGs. It was the first console game by a group of veteran PC developers, and it shows. Combat is flashy animation played over behind-the-scenes dice rolling. Literally in this case – KOTOR 2 was one of the last major RPGs to be based on a pen-and-paper game (Star Wars d20), a holdover from a time when video games followed, rather than led, the RPG market. KOTOR 2 was made in that moment, forever frozen between Baldur’s Gate and Mass Effect. That’s its thing, to be caught between worlds. It’s too sophisticated for a proper Star Wars game, too flashy for the old-school RPGs, too wedded to dice for the new, and too broken to be great, but just broken enough to be unique.